This is the first collabo release between the legendary Tru Thoughts record Label & Vinyl Digital. Currently on Tour with incredible Bonobo, this release marks the Vinyl Debut of Werkha. Call it Bass Music, call it Post-Dubstep or just good & innovative music! 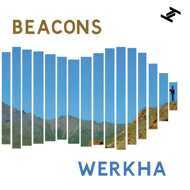 With five unshakable tracks that fizz with energy, mixing up the tempos and blending nuanced live instrumentation with grin-inducing and eminently danceable beats and melodies, “Beacons” is sure to see Werkha rising further up the ones-to-watch lists, after a big 2013 which saw his reputation spread swiftly. Werkha is the project of Manchester based musician and producer Tom A. Leah. With his debut EP, “Cube & Puzzle” (Cool Kid Music) in late 2012, his refreshing style gained him over 300,000 video hits and widespread tastemaker support. In addition to BBC 6Music play and Worldwide blog coverage, Gilles Peterson also picked an upfront track, “Sidesteppin’ feat. Bryony Jarman-Pinto”, for a Brownswood Bubblers compilation. Festival sets including Latitude and Dimensions, and regular spots at the likes of Fabric, all added to Werkha’s profile; and a remix for Dutch Uncles’ single “Fester” (Memphis Industries) also helped to introduce his production style to the masses.